I'm so excited to share photos from my trip to St. Maarten with you while Katie is off enjoying the island herself. I've been lucky enough to visit St. Maarten twice and have loved it both times. I mean, it's a Caribbean island, what's not to love? 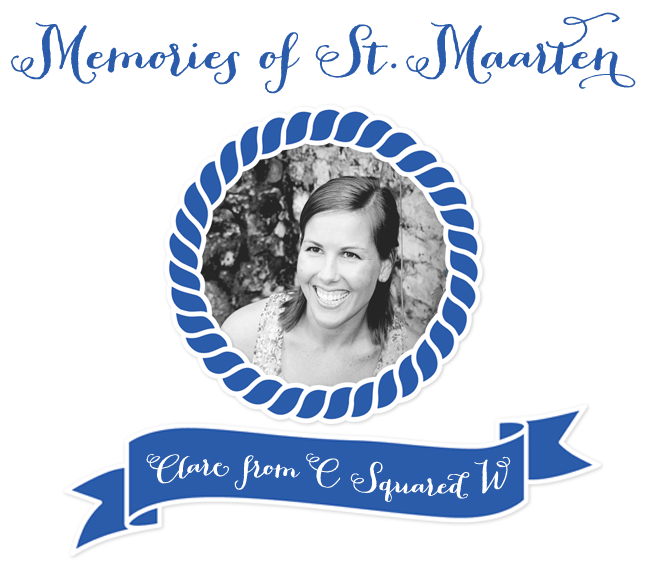 I first went to St. Maarten with my neighbor and best friend growing up, Susanna, and her family. I have fond memories of red-roofed buildings, clear water, and green mountains. We rode horses on the beach, and saw parrots, goats, and monkeys. We were lucky enough to get half of our hair braided and beaded with corn rows (we were 11!) and to buy shell jewelry. It was magical. This past May, I visited St. Maarten with my sister, Frannie. She visited my husband and I in Dominica, and then we flew to St. Maarten together enjoy a few days of luxury. Frannie and I stayed on the Dutch side of the island at the Holland House in Phillipsburg, mainly because it was right on the beach. Hotel guests were also allowed to use complimentary beach towels and beach chairs (many hotels in the area charge extra for this), so we took full advantage of that. For our few days we had the entire beach to ourselves, which was absolute heaven! Our hotel room was nice and my only complaint was the bathroom, which seriously needed a facelift. The hotel restaurant and lounge, however, was especially awesome. It was the perfect spot to enjoy morning coffee or cocktails before dinner with an amazing view. We were also just steps away from Old Street, which had several fantastic French cafes where we enjoyed breakfasts and lunches daily. There was also a ton of good shopping in the area. One day Frannie and I took a local bus to visit the French side of the island. We went to Marigot, the French capital, and enjoyed the shops and good restaurants. Our favorite part was visiting the the art gallery of Roland Richardson, a well-known painter from the island who paints in a colorful, Impressionistic style. The art gallery is a beautiful old building which was actually Richardson's childhood home. I loved Richardson's artwork so much that I ended up purchasing one of his etchings as a gift for my husband! Another afternoon Frannie and I went on a boat tour and went snorkeling at a nearby reef. The resort with the red roofs is actually where I stayed back in middle school, so now I've actually gone snorkeling in these reefs on two separate trips. Pretty cool! Saba, St. Barth's, and Anguilla are all just a quick ferry ride away from St. Maarten! If we'd had extra time, we'd love to have visited one of these islands. A trip wouldn't be complete without a weird photo beside some sort of mural, sign, or statue, right? We had a great trip, and I'd love to go back sometime! Homemade chocolate treats from the chocolate shop on Old Street. A boat trip and snorkeling, we went with one of the companies located on the dock in Phillisburg, it was great. Evening cocktails on the Holland House patio lounge. The guavaberry-coladas were so great! Dinner at Shivsagar Restuarant. This was an awesome Indian restaurant in Phillipsburg where Frannie and I feasted on an amazing meal! Thank you Clare for sharing your trip & the wonderful photos! I hope you are having an awesome time in Rome today :) For those of you who haven't met Clare yet, take a second and go visit!